Reasons for survival. The tax, signed into law by President William Howard Taft as part of a complex legislative deal intended to block enactment of an income tax, has remained on the books for more than a century for three reasons. First, it exemplifies Senator Russell Long's aphorism on the political economy of taxation, "Don't tax you, don't tax me, tax the fellow behind the tree"—with corporations playing the role of the fellow behind the tree. Many Americans have an oversimplified view of who really "pays" the corporate income tax. Workers, capitalists, or consumers? But American voters seem confident that it's not paid by them, at least not in the form of a visible deduction from their take-home pay. Politically this was as great an advantage today as it was a century ago. Second, Americans vaguely feel that the corporate income tax amounts to a tax on the rich, especially the top 1 percent. Insofar as the ultimate payers are shareholders rather than workers or consumers, this is roughly right, since the top 1 percent hold nearly 50 percent of shares owned by households. However, the bottom 99 percent own shares as well, as do pension funds, college endowments, and art museums. Moreover, it's far from obvious that shareholders bear the main burden. Consumers and workers, though blissfully unaware, are big indirect payers in the form of higher prices on the goods they buy and lower wages thanks to the retardation of capital investment. That said, populist folklore equates the corporate income tax with a tax on the rich. Third, from an administrative standpoint it seems easier to collect $100 billion of tax revenue from one thousand corporations than from ten million shareholders. But modern electronic accounting systems deprive this rationale of the force it once had. For the moment, these familiar arguments suffice to prop up the corporate income tax structure. But external forces are battering away. In particular, three forces are mounting a powerful attack. Within a decade or two, under their pressure, the structure will likely collapse and the corporate tax will consequently fade into the history books. Businesses that identity themselves as pass-through entities are the first corrosive force. 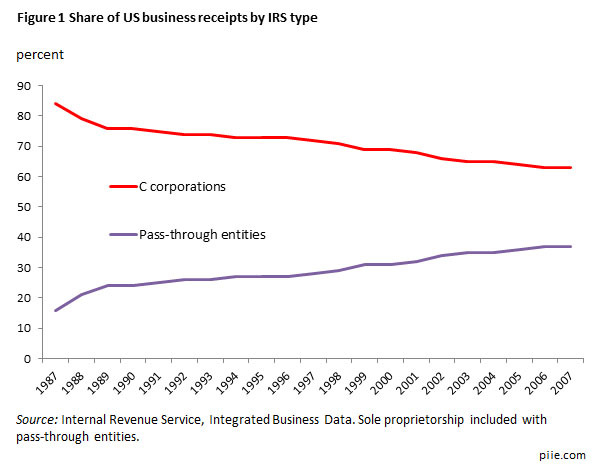 Since 1980, pass-through entities have expanded to where they now account for about 40 percent of US business activity. Subchapter C corporations, the traditional sort, account for the other 60 percent (figure 1). Seven pass-through entities are recognized in the Internal Revenue Code (IRC): partnerships, Subchapter S corporations, limited liability partnerships (LLPs), limited liability corporations (LLCs), master limited partnerships (MLPs), cooperatives, and real estate investment trusts (REITs). Income earned by these business forms is attributed to the beneficial owners and taxed accordingly—not at the business level but at the ownership level. Creative lawyers constantly find new ways to expand the domain of pass-through entities. Equally important, the entities are beloved on Capitol Hill as emblematic of "small business." Foreseeably their domain will continue to expand, further shrinking the share of business activity taxed at the corporate level. Nonprofit organizations are the second corrosive force. Nonprofit organizations are gradually expanding into new domains, sometimes in competition with business firms. Churches, universities, hospitals, and museums are traditional forms, while natural resource preservation, health clinics, public interest groups, super PACs, and think tanks are some of the newer forms. Under the IRC, nonprofits do not pay corporate tax, even when their books record a surplus above outlays for wages, rents, and other expenses. Their share of private employment has expanded from about 7 percent in the 1970s to 10 percent today. They are squeezing, if only modestly, the share of corporate activity in the US economy. For obvious reasons, no politician seeks to subject nonprofit organizations to the corporate income tax or any other business tax. Foreign tax competition is the third corrosive force, one that some politicians are eager to deplore and try to counter with ill-conceived legislative measures. Treasury Secretary Jacob Lew leads the charge today, with the support of President Obama. Yet the Obama economic team is fighting a losing war, especially since their efforts conflict not only with the self-interest of multinational corporations and foreign countries but also with historic US advocacy of open investment worldwide. Many countries have attracted multinational corporations (MNCs) by lowering their corporate tax rates and otherwise creating an attractive tax climate. Just as some US states, such as Texas, Washington, and Ohio have eliminated their corporate income taxes, so Ireland, Singapore, and Switzerland offer very low rates. Even large countries, such as Canada, China, and the United Kingdom have joined the lower-tax brigade. Not only do such countries tax corporate income earned at home at modest rates, but they also tax corporate income earned abroad very lightly, if at all. Meanwhile, since 1986, the United States has kept its federal corporate rate at 35 percent, now among the highest rates, and it continues to tax MNC income earned abroad. The outcome is not surprising. Some US companies choose to "invert," i.e., they merge with a foreign firm, which then becomes the parent corporation. Other US companies are simply acquired by foreign firms. Either way, the US Treasury no longer has a tax claim on the income of subsidiary corporations based abroad. Meanwhile, nearly all US-based MNCs try to locate income derived from intellectual property rights (trademarks, copyrights, patents, and trade secrets) in low-tax jurisdictions. The US Treasury loses more revenue. When tax rates make a difference between producing in the United States and producing abroad, some firms choose to produce abroad and export back to the United States, causing a loss of still more revenue to the Treasury. The ideas of President Obama and Secretary Lew are a weak and ineffectual response to foreign tax competition and other forces eroding the corporate tax structure. In the next blog post, we offer a constructive suggestion.